in discussion Radiohub Discussion Forum / General discussion » Perma banned from hub before using? Re: I was banned permanently...no reason explained in return. in discussion Radiohub Discussion Forum / General discussion » I was banned permanently...no reason explained in return. So if you are unable to help me… who can? Another Op? Please somebody help me to get in the hub again. I'm sorry I am unable to help you. by the way…is there a chance I can re-enter to the hub? Thanks in advance and hopping there'll be a positive answer. [15:49] <karmapolice> You are banned from this hub. what is the message you get from the hub when you try to log in and get bounced? I was banned permanently...no reason explained in return. I was banned from the radiohead hub. I explained the reason to the ops but it seems they don't believe me. The reason the hub gave me is that "they don't treat kindly to assholes". which was reset after a power outage. It was during an electrical storm. I don't know if this was believable, but when nature strikes, there's nothing you can do to stop it. Done with the explanation, ny point is very simple: I need to get back to the hub because I really want to share live gigs not only from Radiohead, but from other bands as well. So, please consider my explanation about this connection issue. in discussion Radiohub Discussion Forum / General discussion » Can't connect to hub? in discussion Radiohub Discussion Forum / General discussion » Have i been blocked by joe? Just not logged in! My computer has been wonky since last night. Thanks for being Considerate though. I'm happy to upload TBs as long as they are shared back! Note the hub ip will be changing soon and there might be some downtime. Keep an eye on the fb group or use soundofconfusion.no-ip.org to redirect you. Have i been blocked by joe? in discussion Radiohub Discussion Forum / General discussion » Connection refused? the server was down but is back up now! in this instance if you leave your client running it should pick right back up when the servers get reset. For the last few days I have been able to access the hub fine, but today it's coming up with a message saying "Fail:connection refused" when I attempt to connect. Just started here and I'm eager to get back on! Re: What's your favourite general? in discussion Radiohub Discussion Forum / General discussion » What's your favourite general? This is near me. It's a Polish supermarket. 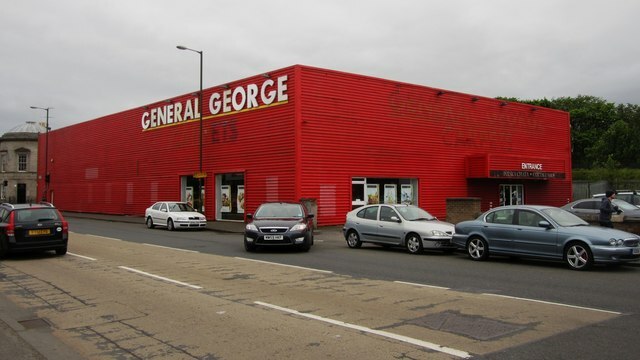 But General George Carpets used to be there. They generously left the sign. The Polish supermarket hasn't adopted the name or anything.